RAILROAD.NET • View topic - D&H Alco PA's... in Detroit? In 1975? I have a George Hockaday slide of D&H PA's facing Amtrak Turboliners in Detroit. Anyone have an idea of why D&H PA's went to Detroit?? 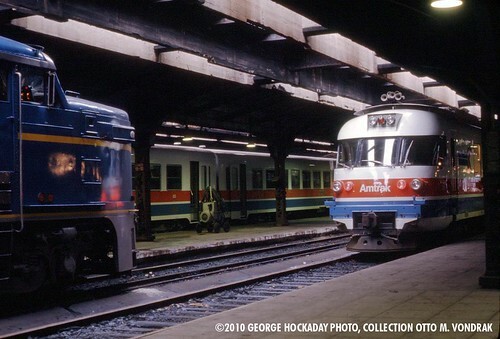 D&amp;H PA and Amtrak Turbos in Detroit, 1975. Re: D&H Alco PA's... in Detroit? In 1975? They were either going to or coming from MK. MK? Is that for Morris Knudsen? 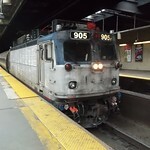 Obtained from the Santa Fe in 1968, and painted in a blue version of the "War Bonnet" scheme, the four ALCO PA-1's were used to upgrade the power on passenger trains between Albany and Montreal and then later became part of a preservation project under the guidance of Carl B. Sterzing Jr., Chief Executive of the Delaware and Hudson. Rebuilt by Morrison-Knudsen in 1974, to PA-4 specifications, with the newer Alco 12 cylinder Model 251 prime mover replacing their older 16 cylinder model. Along with normal freight duty, they participated in public relations ventures and railfan trips until the end of Mr. Sterzing's tenure, including a sojourn with the MBTA pulling passenger trains out of South Station Boston. They were later shipped to Mexico on a long term lease in 1978 - 17 is still in working order with the FNM (Ferrocarilles del Pacifico) and numbered DH-17. Definitely coming from MK. You can clearly see the new sand filler hatch and MK rebuild plate. All four PA's worked their way east after rebuilding. In the lead no less. Also note the shiny paint. George also had a pretty famous photo of #16 I believe, leading a train with Buffalo Central Terminal in the background. Anyone have any pictures of them in Ontario ? I would assume they ran the old CASO main from Windsor to Fort Erie. There's also a picture in Chris McDermott's book "PA-4 Locomotive" that shows #18 alongside Turboliner 69 on August 19, 1975 in Detroit. Ironic since the PA-4s ended up being replaced by Turboliners in Feb 1977. Benjamin Maggi wrote: MK? Is that for Morris Knudsen? Yes, I'm aware the D&H *had* PA's, I just was not aware that the rebuilt units were shipped through Detroit... and pulled trains all the way home! Just adding context in case others stumble on this conversation. At the time they came back there was no Lakeshore Ltd running,so Detroit thru Canada was the routing. I don't remember if all 4 went thru Detroit or not as the Lakeshore started up(I think) either oct or nov 1975. At least one PA came back on the Lake Shore Limited--I have a photo of it coming down West Albany Hill trailing behind a pair of SDP40f's. At least one of the others came back leading--Audio Visual Designs had a shot of one crossing the Mohawk River at Hoffmans in one of their slide sets (remember, this was before the return of AMT service to downtown Schenectady). Those two I'm sure of. If I remember correctly, one of the trips came through Denver (presumably off the Pioneer/SF Zephyr). I think I remember seeing a night shot of one at DUS a few years back. Wow, great catch. That is hella cool picture. Turbos? PA's? MI Central Station? OK, I can confirm at least one delivery date. I've been scanning slides for archive, and yesterday turned up some shots at Rensselaer dated Nov 18 1975. PA # 17 is tucked in behind an Amtrak SDP40F, having just arrived on the newly-reinstated Lake Shore Limited. I got tipped off to its arrival by phone (I think 17 was the last one delivered) and headed trackside to watch the arrival. As I noted earlier, I'm pretty sure that Audio Visual designs published a slide set about that time that featured a Lou Wasserman photo of a PA leading an Amtrak train across the Mohawk River at Pattersonville. My guess is that the train was the Niagara Rainbow, but that's only a guess. I never bought the slides, but have seen them on various living room walls over the years. Fast forward to 2014......in Stephen M.Timko's new Morning Sun Book Amtrak Power In Color there is a picture of one of the PAs at Detroit sandwiched between two Amtrak E-units with an RTG Turboliner a few tracks over to the right. The whole photo is mis-captioned as Montreal's Windsor Station in August 1975 and doesn't even mention the PA's obvious presence. This couldn't have been Windsor since the date is wrong for Turboliners on the Adirondack (1979), plus that train used Rohr Turbos; not the older RTGs. The presence of Es at Windsor in 1975 isn't impossible since the Montrealer/Washingtonian was running then, but it is highly unlikely one of D&H' newly rebuilt PA-4s would ever be coupled between that train's engines for any reason.